The Aphididae are a very large insect family in the aphid superfamily (Aphidoidea), of the order Hemiptera. Several thousand species are placed in this family, many of which are well known for being serious plant pests. They are also the family of insects containing most plant virus vectors (around 200 known) with the green peach aphid (Myzus persicae) being one of the most prevalent and indiscriminate carriers. Aphids originated in the late Cretaceous about 100 million years ago (Mya), but the Aphidinae which comprises about half of the 4700 described species and genera of aphids alive today come from their most recent radiation which occurred in the late Tertiary less than 10 Mya. Members of the Aphididae are soft-bodied, pear-shaped insects called aphids, as are other members of the superfamily Aphidoidea. Most of them have a pair of little tubes, called cornicles, projecting dorsally from the posteriorof their abdomens. The cornicles have been variously interpreted in the past, either as organs of excretion, or for the production of honeydew, but in fact their only confirmed function to date is that they produce fatty alarm pheromones when the insects are attacked by predators. When wings are present they occur only on particular morphs called "alates", and wingless morphs are said to be "apterous". The forewing (mesothoracic wing) of the alate in the Aphididae has four to six veins attached to a major vein-like structure that has been interpreted as the combined stems of all the other major wing veins. That structure ends in a stigma, a solid spot on the anterior margin of the forewing. The rear (metathoracic) wings have a similar scheme, but simpler in structure, with no stigma The rear wing however, does bear a hamulus, a small hook that, when in flight, engages the claval fold of the forewing, keeping the wing beats in synchrony. 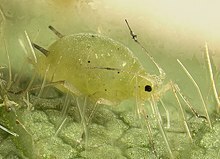 All aphids have very small eyes, sucking mouthparts in the form of a relatively long, segmented rostrum, and fairly long antennae. These insects are so small (a few millimeters in length), that winds can transport them for fairly long distances. They are often green, but might be red or brown, as well. They move quite slowly and cannot jump or hop. Aphids excrete a sugary liquid called honeydew, because the plant sap from which they feed contains excess carbohydrates relative to its low protein content. To satisfy their protein needs, they absorb large amounts of sap and excrete the excess carbohydrates. Honeydew is used as food by ants, honeybees, and many other insects. There are an extremely large number of aphid genera which are dealt with under each subfamily. For which see taxobox. ^ a b Richards, O. W.; Davies, R.G. (1977). Imms' General Textbook of Entomology: Volume 1: Structure, Physiology and Development Volume 2: Classification and Biology. Berlin: Springer. ISBN 0-412-61390-5.